A photograph taken in the replica of the Oval Office at opening day for the Ronald Reagan Presidential Library in Simi Valley on November 4th, 1991. All four former Presidents are in the photo: Richard Nixon, Jimmy Carter, Ronald Reagan, Gerald Ford and current President George H. W. Bush. Each of the former First Ladies are also present including Mrs. Lyndon Johnson. The version Church has contains signatures on the bottom from all members present in the photo. Reagan was President of the United States from 1981 to 1989. He was Republican. 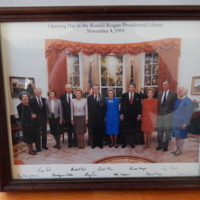 David Valdez (the photographer), “Signed Photograph Taken at Dedication and Opening Day for the Ronald Reagan Presidential Library,” UIS History Harvest, accessed April 22, 2019, http://uishistharv1.uis.edu/items/show/214.